The magical month of September has arrived and it really came in with a roar here in Washington State with a major wind storm. At the time of the full moon of August 29th the planet Uranus, which rules wind and storms was conjunct the dark moon Lilith. This activated storm energy here in Washington because Saturn is still on 29 degrees Scorpio, which rules the West Coast, including Oregon and Northern California. Uranus also has been activating fire energy all summer because it is in the fire sign Aries. We have had the worst fires ever in Washington State. The fire asteroid Vesta has also been in Aries activating Mars in Leo, another fire sign. The Earth will be in fire energy for a long time. When Saturn goes into Sagittarius that planet will be in a fire sign. Uranus will be in Aries for another three plus years and Saturn will be in Sagittarius for the next two and a half years. Doesn’t the Bible say the end comes with fire? I think we have made it to the end of an age, and ready to move into New Earth energy. It’s also my understanding that the fire initiation is the last of the initiations and it activates the energy of Love. Many people have been looking forward to the arrival of September because of all the events that are predicted to happen this month. The largest one is the culmination of the waves that have been hitting Earth all summer. These waves started coming in at the Spring Equinox when Saturn moved back onto 29 degrees Scorpio. I felt the first wave hit on Sunday June 28 and the energy felt really good to me. The waves have continued to come in all summer and this has caused the energy to become very intense. The culmination of these electromagnetic waves may occur on September 13th when Lilith, the hidden Goddess, will be conjunct Alcyone in opposition to Saturn on that eclipse day. The hidden Goddess is returning in all her power. 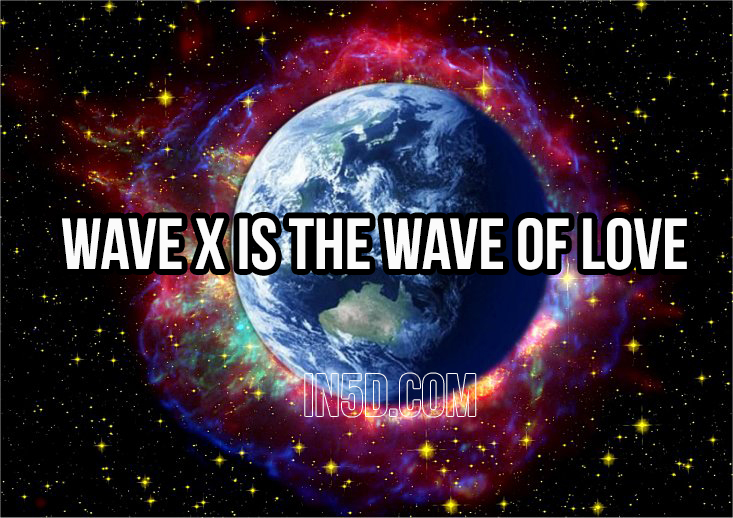 People have been calling this energy Wave X and say it is a Wave of Love. I agree with them. The energy of love has become very strong if you tune into it. I received an email from Simone M. Matthews. Here is a link to her article at: Universal Life Tools.com. She is talking about the Wave of Love and has several graphics in her article. When I first looked at the graphic of the Galactic Alignment I realized that our Solar System will be lined up with our three major suns-Alcyone, Sirius, and the Galactic Center in September. If you have seen the movie The Dark Crystal you will know what I am talking about. In the movie the crystal had to be in the proper alignment at the time the three suns lined up in order to save the Earth. It looks like we will reach that point in September 2015. In my last article I said that the Earth was the 8th star of the Pleiadian Star System. I was wrong. I should have said our Sun is the 8th Star. It says in the book The Pleiadian Agenda by Barbara Hand Clow that Alcyone is always in the Photon Belt. It’s my understanding that Alcyone has 7D energy and that is what we have been experiencing all summer because Saturn has been exactly opposing Alcyone all summer. Alcyone is on 29 degrees Taurus and Saturn is on 29 Scorpio. Have you felt the intensity of this energy? When Saturn moves into Sagittarius on September 17th the focus will start being on things like our higher mind, college, philosophy, law, travel, religion, and freedom. Mercury also turns retrograde on September 17th. Because Uranus is in Aries, which will make a nice trine to Saturn in Sagittarius, the energy will be ‘Don’t tell me what to do, I will not be controlled any longer, I want my freedom’. Jupiter is the planet that rules Sagittarius. Jupiter is now in the sign of Virgo, the Goddess. Lots of love energy was coming to Earth last year when Jupiter was in Leo and our hearts were opened, some with heart attacks. Now that Jupiter is in Virgo it is time to manifest heart energy. Just be the Love that you are. Other events that are predicted to happen in September are two eclipses. The first will be a solar eclipse on September 13th and the second a blood moon eclipse on September 27th at 7:50 pm PDT. September 13th is the last day of the Shemitah and then we enter the year of Jubilee. Every seven years there is a financial crash, or slow down and that has already happened with the crash of the Chinese Stock Market in July. Then in August the Stock Markets of the whole world went down. We will probably feel the effects of that crash for a while, although we are about to enter a year of celebration. What will that bring? The Earth is still in her cleansing cycle and this will continue for a few more years. We do not have to be concerned with this energy if we manifest love. With love you can walk through fire without getting burned. And whoever manifests from a higher dimension Earth may not even be aware of what is happening on the lower dimension Earth. I think it is time for the separation of the wheat from the chaff. Rosh Hannah, the Jewish new year is on September 13, and Yom Kippur, the Day of Judgment, is on September 23. This is the day the Pope will meet with President Obama and the next day he will address our Congress. On September 25 he will speak before the United Nations. Then the Harvest full moon will be on September 27th.This will be the final blood moon of the series of four. We will have an interesting month. I’m looking forward to it because I think the culmination of the waves of love will move us into a much higher energy. Welcome to the New Earth. It’s time to live in the wonder and awe of magic and miracles and to manifest our spiritual gifts. We do live in exciting times. All is well in my World! So Be It! I am an Astrologer, Writer, and Speaker. I write an article called Planet Alert that is published once a month and goes out on the Internet for free. I have been writing this article since 1988. I was the editor of the Newsletter that was mailed out by the Asclepius Light Center for many years. In December of 2008 we stopped sending out the newsletter by snail mail and my Planet Alert went online. I have also been a guest on many TV programs, radio programs, and for the last few years, internet radio programs. My specialty is Mundane Astrology, also called World Astrology. My writings have been helping people understand what is going on in the world and how it is affecting them. I think I have done a good job because people seem to enjoy my articles. I will continue to write these articles for as long as they are needed. People from all over the world read my articles, and it is fun to get emails from people in different countries. As of this writing, which is November 2013, we are now in a new energy that is much different than it has been in the past. The world will now become a much better place to live because we will be living on a higher dimensional world. The old way of doing things will disappear and the new world of love will survive. So Be It!